The March 8 New York Times op-ed, headlined “London’s Laundry Business,” was contributed by Ben Judah, author of last year’s Fragile Empire: How Russia Fell In and Out of Love With Vladimir Putin. The piece did not sit well with another author, Sean Thomas, who writes thrillers under the pseudonym Tom Knox and is currently working on a memoir. The essay begins with a series of bizarre inaccuracies and insults – “London’s buses are still dirty” (no they aren’t), “Londoners are passive-aggressive” (no they’re not), “London’s planning regulations have been scrapped,” (no they haven’t). Then we get to the nub of Judah’s argument. He’s hacked off that we aren’t supporting America’s vigorous stance against Putin. 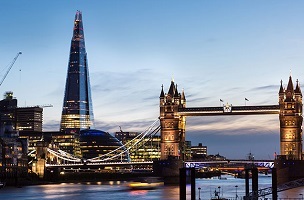 Further into his response, Thomas “has a bash” at itemizing three of Judah’s egregious additional inaccuracies, including a portion tied to The Shard, a stunning new 72-floor Qatari-owned skyscraper. Thomas points out that there’s just one problem with Judah’s vivid canvas of super-rich dudes on top floors entertaining hookers a la Wolf of Wall Street. No apartments have been sold or rented yet. Yikes.